I really dislike all seafood. I remember ordering a chinese dish and getting shrimp instead of chicken. I took one bite and that chewy texture of the shrimp was so gross to me! But when I was trying to eat better after my first son was born, I decided to try salmon. Salmon is a good start if you hate seafood. I loved it! Now I will actually order salmon when I go out to eat because I have grown to love it so much. It is healthy for you and it isn’t too extreme with the fishy taste. My nine year old actually thought that it was chicken! 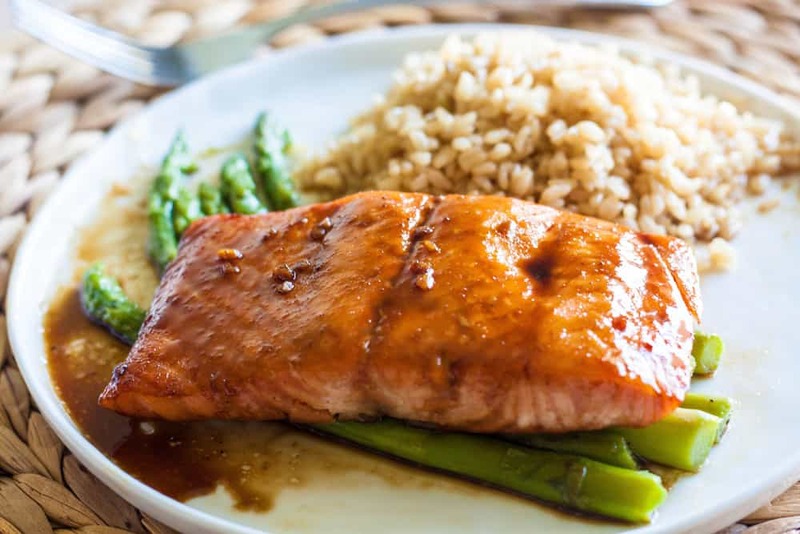 Delicious melt in your mouth salmon with an amazing asian glaze! In a medium saucepan, whisk together brown sugar, soy sauce, hoisin sauce, ginger, red pepper flakes, garlic and lime juice. Bring to a boil over medium heat until sauce thickens. Set aside. Preheat the broiler to high. Line a baking dish with foil and place salmon on top. Baste with glaze and broil for 4 minutes. Remove salmon from the oven, turn over, baste with glaze and return to the oven to broil for 4 more minutes. Carefully remove salmon from the oven and baste one more time before serving. This looks delicious! I love salmon. Thank you for sharing this recipe. I pinned it. I just made this today and it was astounding! Thank you so much! Made this tonight and it was so good. Will make again! This is great. We were looking for a new preparation for salmon…my husband was making fried rice…it all went together really well. Very tasty.